An Arts After School class is led by UNCG music education majors. 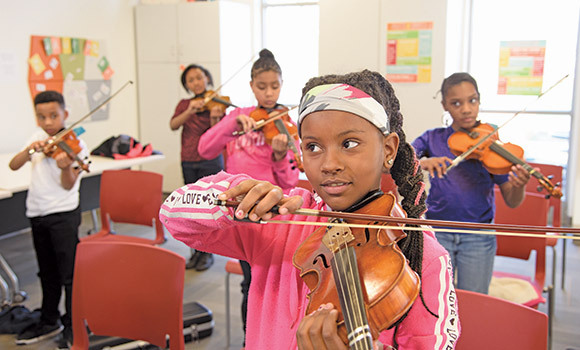 Erika Rauer saw the usual suspects when she poked her head into a student-led violin class at a Greensboro Boys and Girls Club – an enthusiastic teacher surrounded by six focused children. But the object of focus wasn’t a violin; it was a small, squishy ball – passed swiftly but intently to the beat of a hip-hop violin piece. Just as the third-graders got comfortable with the beat, the UNCG music student changed the cue, giving the children a new challenge. “It’s a simple game, but for kids, it can be hard,” says Rauer, who oversees the Arts After School initiative in her role as program director for the UNCG Community Arts Collaborative. Through Arts After School, UNCG music students – graduate and undergraduate – teach experiential music education once or twice a week to underserved elementary-age children. The kids are eager to play instruments, ranging from the piano and violin to guitar, percussion and cello, and the weekly lessons give them great exposure – beyond just the technical skills specific to their instrument. “We ask our student instructors to think about that rounder music experience and push them to bring other skills to the classroom,” Rauer says. “If you only get to practice a musical instrument once or twice a week, it’s unlikely you’ll be highly proficient at the end of the year.” But that’s not the goal right now. As children master the rhythm, they also learn high-level thinking, perseverance and listening skills. “Those are directly relatable to understanding any content, whether it’s math or literature. Music teaches kids the ability to hone their focus,” she says. It’s a unique learning experience for the student instructors as well. According to Dr. Peter Alexander, dean of UNCG’s College of Visual and Performing Arts, 21st-century arts students will need a different kind of toolbox than that of previous generations. With faculty collaborators, Rauer is currently expanding Arts After School to include other disciplines, such as theater, visual arts and dance. Plus, Rauer adds, through the arts, children can put their ideas out there to be seen by other people.